This year, I happen to be growing all of my vegetables from seed, which is a throwback to when I started vegetable gardening. In the interim, there have been years where I grew entirely from plants purchased at a nursery. During most years though, my vegetable garden has consisted of plants started from a combination of seeds and plants. Why the constant change? Whether to grow vegetables from seeds or plants depends on an ever-changing context of gardening goals, gardener abilities, and personal responsibilities and lifestyle. I asked my friend Erik what he thinks about growing vegetables from seeds versus plants, and he said he prefers seeds. Why? I agree, in the sense that it’s a marvel to watch a seed germinate and unfurl its cotyledons. It wakes and emerges from the soil like a hatching bird. It stretches toward the sky. It’s alive! It really feels miraculous, every time. 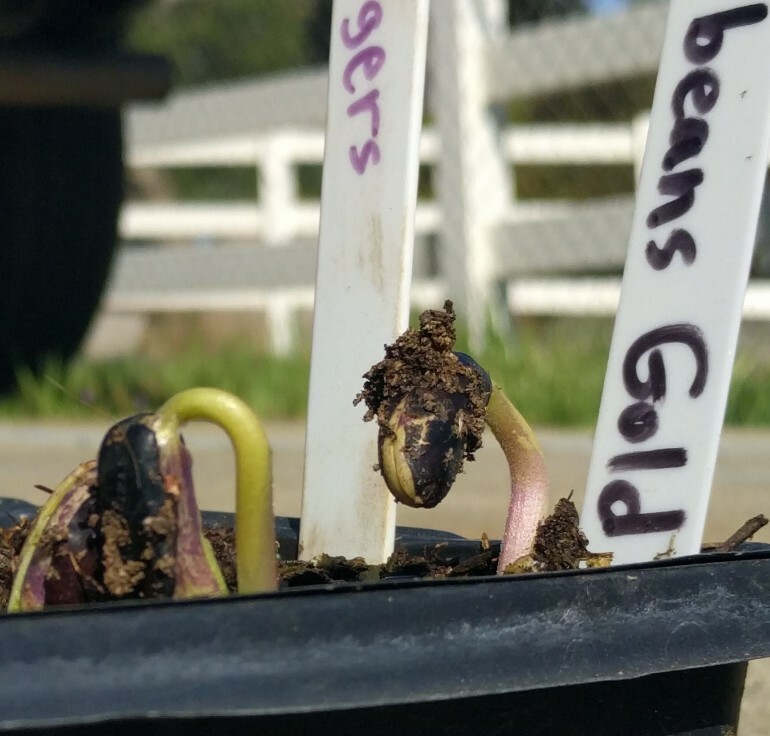 Bean seeds coming to life. In fact, growing vegetables from seeds might not be fun at all if you’re just learning to garden. You might have a lot of failure. That wasn’t so fun for me when I started. I remember sowing my first seeds. They were peas. What do I do, just bury them in the ground? Don’t they need water? How? Most of that first pea crop failed. As you get more seasons under your belt, however, you may have grown every variety of a certain vegetable that your local nursery carries. I feel this way with tomatoes right now. 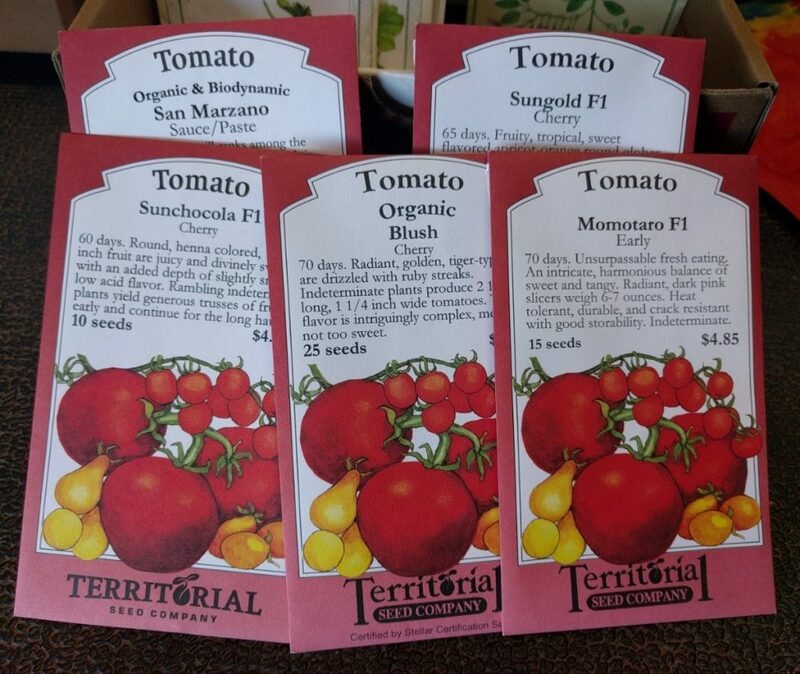 Nurseries carry many varieties of tomato plants (usually starting in March), but look at the seed rack and you’ll find five times more. Moreover, look at the catalogs or websites of seed companies and you’ll be overwhelmed with the possibilities. This year, I’m only growing five tomato varieties, and three of these are unavailable as plants from my local nurseries. What if my tomato sowings fail? I can always fall back on buying plants of whatever varieties are available at the nurseries. I love the convenience of growing vegetables from plants. 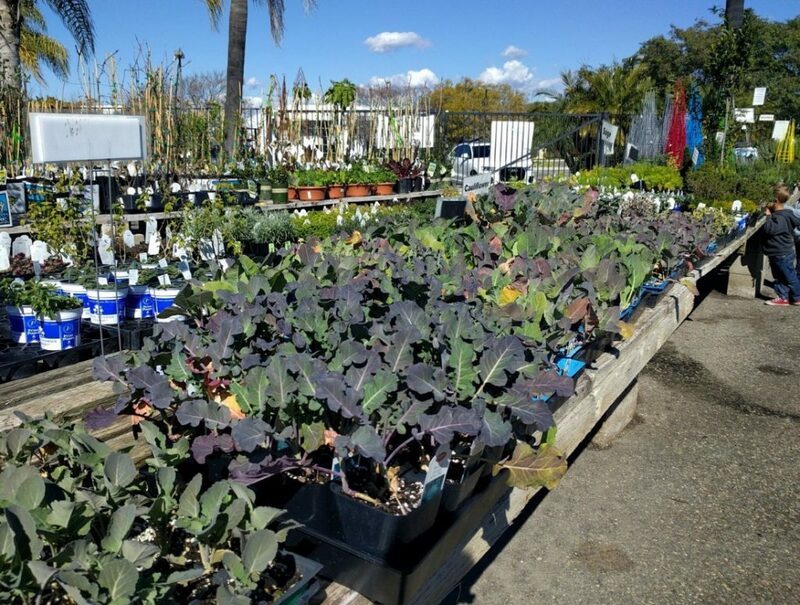 Whenever you’re ready to plant, the nursery will most likely have plants ready to buy. Table of vegetable seedlings at a nursery. So here’s a good middle ground. You try some vegetables from seed, and if it doesn’t work out you go buy plants. Seeds are cheaper, but . . .
You do pay for the convenience of those ready-to-plant seedlings at the nursery. What does a pepper plant cost? You might find a six-pack of small ones for $4 or $5, or you can buy a bigger single plant for $4 or $5. On the other hand, what do pepper seeds cost? Even for fancy F1 hybrid seeds, you can get 10 seeds for about four bucks. This year, I’m growing a poblano-type pepper called Bastan, and the packet of 10 seeds cost $3.70. Always, seeds are cheaper, but don’t forget to count the time and effort of getting those seeds up to the size of the plants you’d buy. You must count all the costs. 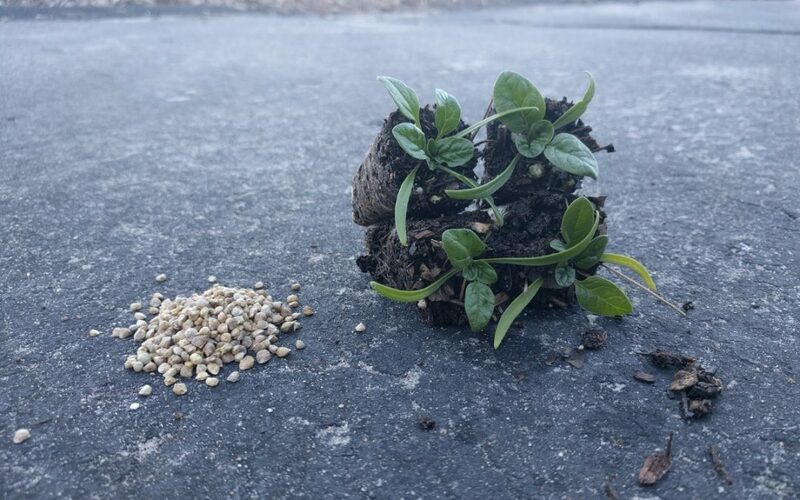 How much time and effort are required to grow from seed? That depends somewhat on how experienced a gardener you are, in addition to what other responsibilities you have going in life. 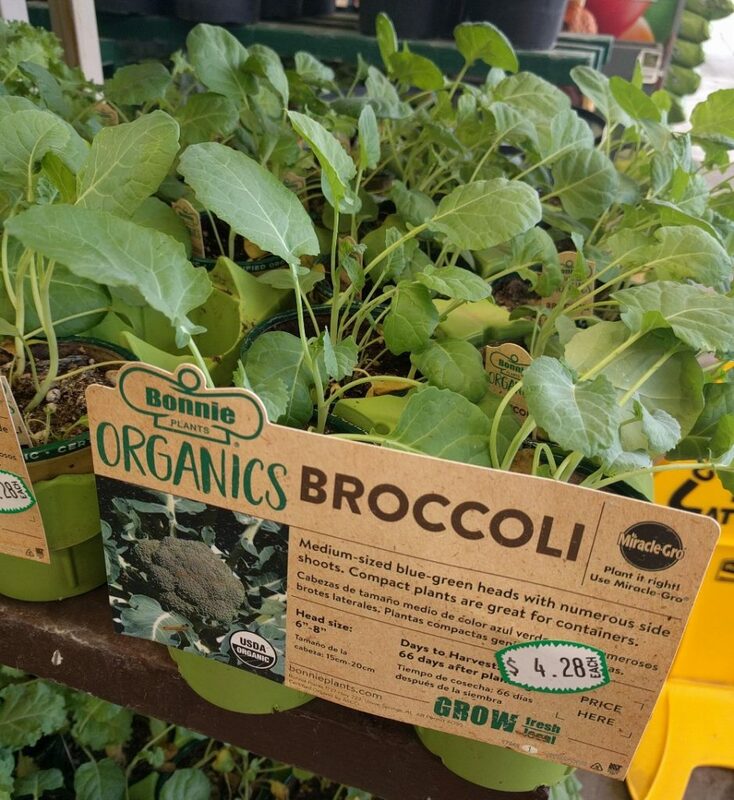 Even at a discount home improvement center, a single broccoli plant costs as much as a packet of seeds. I try to be efficient with the time and effort that I spend vegetable gardening, and so I tend to grow some plants mostly from seed but others mostly from plants because doing so saves time or effort in some way. Some vegetables I almost always grow from seed because the seeds are big and sowing success comes easily: corn, beans, peas. Some vegetables I grow from seed because transplanting plants is tedious: carrots and beets. Some vegetables I always grow from seed because it’s so much cheaper: lettuce and greens. Other vegetables I often grow from plants because they grow slowly from seed: peppers and eggplant. Other vegetables I often grow from plants because the seeds must be started in the heat of late summer when watering can be a real chore: broccoli, cauliflower, cabbage, brussels sprouts, kohlrabi. Other vegetables I usually grow from plants because I don’t grow many and a packet of seeds would be wasteful: squash and melons. Yet, as I mentioned above, I’ve been going 100% seed this year. Oddly, the biggest reason is that I have chickens which make excellent compost that I can use to start seeds in. There’s nothing to buy but the seeds. It’s so easy. My tomatoes are already up and growing in trays. Unfortunately, the other day I caught a towhee pecking at the seedlings; the bird damaged a handful. So in the end, I won’t be surprised to still find myself buying some tomato plants at the nursery on April Fool’s Day. Seeds or plants, however you get started, what ultimately counts is that you get something to harvest. ‘Champion’ tomato harvest a few years back from plants started as nursery-purchased seedlings. 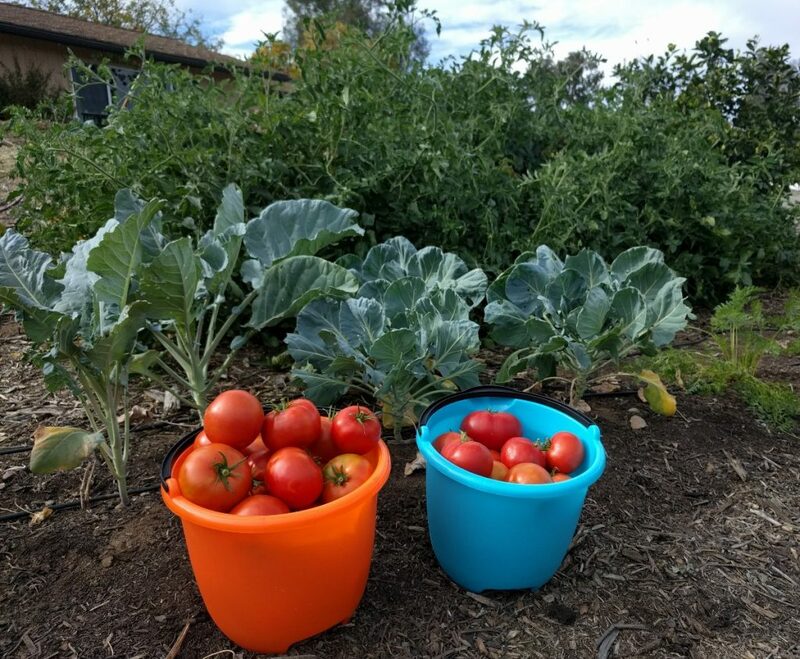 Hi Greg I am an avid reader of your blog and you have already inspired me to try some new things in my garden and orchard this year (I live in north Poway). I sowed some peas a few weeks back after reading your post about ur kids enjoying your peas. In the above article you mentioned your first attempt largely failed. Did u ever figure out the root cause? Luckily I think I see some early shoots from my first attempt at growing peas. Thanks for writing. That first attempt at peas mostly failed because I sowed them in dry soil and then watered but didn’t water deeply enough initially. I didn’t know how much water to apply in order to wet the soil deeply. Then the few pea seeds that did germinate suffered in the summer heat; I’d sown them at the wrong time of year. I just had no idea what I was doing. It’s funny to think back on it. This was when I was living in Africa. I didn’t have any books or the internet to find information. I should have asked someone to help me, but I was shy about that. I just went blindly into it. Got an asparagus bed? I put one in last November and it’s growing nicely but I wondered if there is some conspiracy about selling UC 157 asparagus in state. It’s a variety developed at UC Irvine (or Davis forgot) that is heat tolerant. You can find people selling seeds around here but the only live crowns I could find were out of state. Had mine shipped in from TX, was kind of miffed about having to ship in something that was developed here. btw… that’s the only vegetable besides Tree Collards that I’m growing that I had to get live plants. Everything else I grow from seed, like your friend Erik I enjoy the whole process of growing from seed to table (or pipe haha). I do have an asparagus bed, and it’s partly UC 157, and as I recall I bought those crowns from a local nursery some years back. Maybe something has changed that I haven’t heard of though. I noticed a box that says subscribe to comment… are you supposed to be able to subscribe so you don’t have to fill out the Name Email each time you submit a comment? If so I can’t figure out how it works. Course maybe you should dissuade people like me from making it too easy to comment because we’ll end up spamming you with questions. I mostly grow open polinated varieties, so I save seeds. And yes, I do have failures. They don’t bother me at all. I keep learning what didn’t work this year and then think about what I can try different next year. That’s part of what makes gardening fun. I really like trying different things. One example is that I really love tomatoes and am always trying different ones. I know that I could be very satisfied growing just four varieties every year. I’ve tried so many, and I know that those four are my favorites. But I keep trying different ones just for the fun of it. Thanks for that. I’d never heard of Sample Seed Shop. Looks like a great idea since, as you said, part of the fun in gardening is trying new things. I totally agree with that. There can never be a bored gardener. Greg, I bought a bunch of varieties of pumpkin to hopefully have a patch for my kids. Being new at growing from seed when should I start them in the trays to then plant them in the ground (or should I even bother with the trays and plant them directly in the ground)? Also, should I soak the seeds overnight before planting?